This is the best car for you if you believe that subcompacts are not a completely dead market segment. Kia redesigned its entry-level car for the 2018 model year, updating Rio’s styling, underskin architecture, and suspension, while improving its fuel-economy ratings. Rio is available as a four-door sedan or a four-door hatchback. Both share many elements of their basic design with the Accent produced by Kia’s corporate partner, Hyundai. Accent is similarly redesigned for 2018, but is available only as a sedan. Sales of Rio and rivals such as the Nissan Versa, Honda Fit, and Chevrolet Sonic are in free fall as new-car shoppers eschew maximum fuel economy in favor of trendier and more versatile small crossover SUVs. Fewer than 17,000 Rios were sold in calendar 2017, a nearly 42 percent decrease from 2016. Indeed, every car in the competitive set except the Mitsubishi Mirage and Toyota Yaris experienced moderate to severe sales declines in 2017. Automakers noticed. Model-year 2018 will likely be the last for the Ford Fiesta in North America; expect the Sonic to follow shortly thereafter. Despite the doom and gloom, Kia model-year ’18 Rio redesign shows it has faith in its product and the market segment. And the South Korean carmaker’s slightly larger Kia Soul wagon is in fact the class sales leader. Consider waiting for the 2019 Rio to see if Kia adds more safety technologies and makes them more widely available throughout the model line. For ‘18, the only driver assist offered on any Rio is autonomous emergency braking. This important feature can automatically stop the car to mitigate a frontal collision with another vehicle. But it’s available only on Rio’s flagship EX model, where it’s standard equipment. Wait for the ’19 to see if Kia makes it available on Rio’s other trim levels – the base LX and sport-themed S.
Other safety features increasingly common on all cars — lane-departure warning, lane-maintaining automatic steering correction, and radar cruise control that can maintain a set following distance from traffic ahead — are unavailable on any 2018 Rio. We recognize the Rio is an entry-level car, but the rival Honda Fit offers all these safety features on a trim level priced from just $19,050, including destination charge. Styling: Exterior and interior dimensions change little with the 2018 redesign, but the Rio adopts a fair portion of its revised styling from other small Kia vehicles, including its popular Soul and gas/electric hybrid Niro crossovers. The front end uses the brand’s “Tiger Nose” grille with headlights that sweep more deeply over the front fenders than they did on the previous-generation Rio. The rest of the car’s exterior design doesn’t stand out in any meaningful way, and only the EX grade offers aluminum wheels; the LX and S use plastic covers over steel rims. The updated interior is more interesting. It largely follows Kia convention, with clear gauges and simple climate controls. Materials quality is on par with class rivals. EX models offer a Launch Edition package that includes partial leather upholstery with red trim pieces splashed throughout the cabin. Kia is trying for a sporty look here, but the red panels are matte with no texture to them, so it comes off as a bit cheap-looking. The standard gray-ish/black trim is classier. It’s also disappointing that heated front seats are not offered on any model. LX and S models employ a 5-inch touchscreen display for audio, and we appreciate that satellite radio is standard. EX versions have a larger 7-inch screen with clear buttons flanking it. 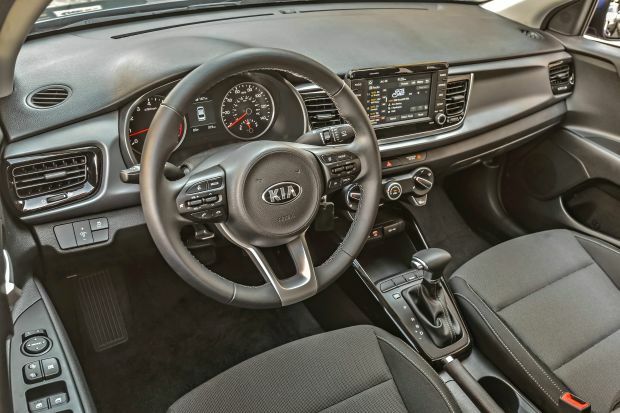 It includes Kia’s intuitive UVO software suite, as well as support for Apple CarPlay and Google Android Auto. Imbedded navigation is not available, so connecting your smartphone and having cellular data service is the only way to get mapping data to appear on the screen. The front seats have soft padding and are exceptionally comfortable. Legroom is surprisingly good thanks to ample seat travel, and only the very tall will be cramped for headroom. The back seat is tight, even for a subcompact car. Adults who are less than 5-feet 7-inches tall will be short on legroom, even sitting behind someone of similar stature. Cargo volume in the sedan is midpack, at 13.7 cubic feet. Hatchbacks have a decent 17.4 cubic feet with the rear seatbacks raised and a below-average 32.8 with them folded. 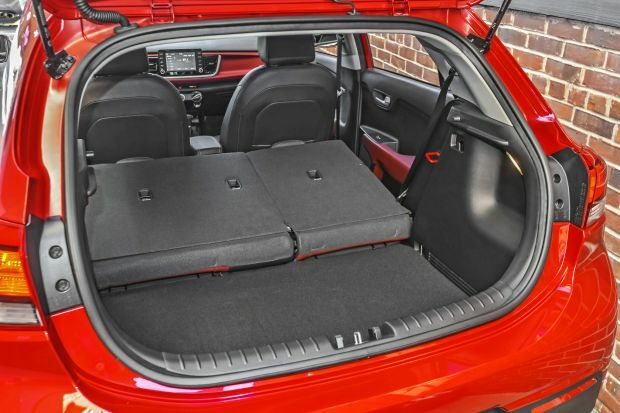 The hatchback’s cargo bay is not deep front to back, but it is from top to bottom. The interior door pockets are generously sized, but the center console bin is rather small. Rio has a thoughtful two-tier shelf beneath the climate controls that can accommodate a pair of smartphones, though you’ll need a 12-volt adapter for one of them as the car has only one USB charging port up front. Mechanical: All Rio models share the same engine. It’s the Hyundai/Kia corporate 1.6-liter four-cylinder, tweaked for 2018 to deliver better fuel-economy ratings. Output declines to 130 horsepower, from 138, and torque falls to 119 pound-feet, from 123. A 6-speed manual transmission is standard on the LX. Optional there and standard otherwise is a 6-speed automatic. Acceleration is good from a stop, but the engine quickly runs out of steam as speed increases. In another effort to boost fuel economy, the automatic transmission wants to get into the highest gear as soon as possible. This results in a frequent need to downshift to a lower gear, even when ascending modest inclines. All models have 15-inch wheels. They seem small but aren’t a detriment to handling, which, like the ride, is stable and predictable. A bit more road feel from the steering would be nice, but grip is surprisingly good. We tested an EX hatchback in the dead of winter, and with the stock tires, it performed admirably even on unplowed suburban side streets. Road and wind noise are well controlled, but persistent ticks and buzzing from the engine at idle and during acceleration, respectively, can get irritating. Features: The LX grade is barebones. It has air conditioning, a height-adjustable driver’s seat, USB and auxiliary audio inputs, and satellite radio. The hatchback body style adds split-folding rear seatbacks. Cruise control, power windows, and a rearview camera are not available. Regarding the camera, US law dictates that all new vehicles manufactured from May 1, 2018 onward, are required to have one. We expect the 2019 Rio LX to accommodate this change. Moving to the S adds body-color exterior trim, heated exterior mirrors, power windows, remote entry, split-folding rear seatbacks for the sedan, rearview camera, rear USB charging port, cruise control, and Bluetooth connectivity. The EX nets fog lights, alloy wheels, upgraded cloth upholstery, 7-inch infotainment screen with UVO, tilt and telescopic steering column, leather-wrapped steering wheel and shift knob, and autonomous emergency braking. 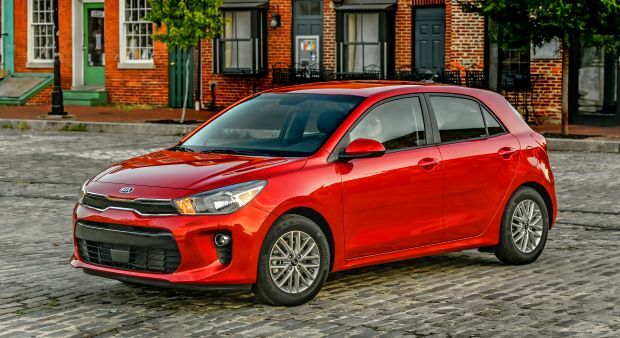 Rio pricing tracks a bit less than most subcompact cars, but keep in mind that it’s also not available with some of the high-end safety and convenience features of its rivals. Base prices here include Kia’s $895 destination fee. For the ’18 Rio sedans, base prices are $14,795 for the LX with manual transmission and $15,885 for the LX with automatic transmission. With their standard automatic transmission, the S is priced from $16,995 and the EX from $19,295 for the EX. The ’18 Rio hatchbacks start at $15,095 for the LX with manual transmission and $16,185 for the LX with automatic. With automatic standard, the S is priced from $17,295 and the EX from 19,595. The only factory options of note are “Aurora Black” paint for $195 and the EX Launch Edition Package for $500. We prefer the hatchback to the sedan, and if the LX offered Bluetooth and a rearview camera, we’d pick that version. As such, the S would be our choice since it lists for less than $17,500 and comes with Kia’s excellent warranty coverage. EPA fuel-economy ratings run with the subcompact-car pack. With manual transmission, the 2018 Rio rates 29/37/32 mpg city/highway/combined. With the automatic, ratings are 28/37/32 mpg. Our test of an EX hatchback saw just 31.4 mpg, but a good portion of that drive included low-speed slogging in the snow. All models use regular-grade 87-octane fuel. Likely not much in terms of the vehicle’s overall design. We would like to see Kia include more driver-assistance features and standard, optional, or both to bring it in line with the Honda Fit. A rearview camera should become standard on the 2019 Rio LX, and we hope Kia will add cruise control and Bluetooth. The first significant design update for this car likely won’t happen until model-year 2021 or 2022.